The Augmented World Expo (AWE) is billed as the largest augmented and virtual reality event in the world. The annual three day conference is in its eighth year and was held at the Santa Clara Convention Center (Silicon Valley) from May 31st through June 2nd. Attendance has grown to nearly 5k attendees, 351 speakers, 212 exhibitors with a significant bump in popularity for 2017. Sitting in the auditorium waiting for the keynote address, the excitement in the room was palpable. Everyone was eager to learn and share what the next great advancements will be in AR/VR. Attendees of the conference consisted of startups, corporations, investors, developers, designers and press. Nearly all attendees were looking for opportunities to network, partner, or invest. High profile speakers included Lorianne Bardeen, General Manager of Microsoft Hololens, and Robert Scoble, popular blogger and technical evangelist of AR/VR technologies. The conference sessions had something for everyone covering a wide range of AR/VR topics, presentation tracks included; Inspire, Design, Develop, Work, Life, and Startup Pitches. Augmented Reality was described many times throughout the conference as the next paradigm shift, similar to the personal computer, the internet, and smartphones. 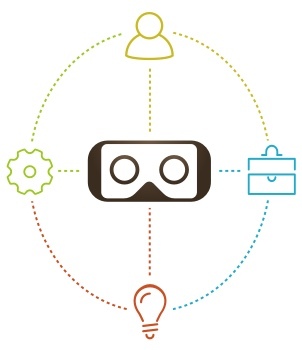 Although the conference is billed as the largest AR/VR event in the world; the conference is predominantly augmented reality focused….as the conference name suggests. It’s become apparent reality can be defined many ways: Augmented Reality, Virtual Reality, Mixed Reality, Diminished Reality, Real Reality, X-Reality, Merged Reality, Locational Reality and Cinematic Reality. Each reality truly represents a specific use and experience. Starting with Virtual Reality, Kopin revealed the “Smallest VR Headset” with 2k x 2k per eye resolution @120Hz, nearly double of that from HTC and Oculus. With all those additional pixels packed into two tiny little screens, pixilation and the “screen door effect” no longer hinder the VR experience. The reduction of weight and size does come at a cost, in the form of a 70 degree FOV. Many people will likely desire a larger range. One of the more popular VR trends of 2017 has been Self-tracking headsets. Utilizing sophisticated SLAM tracking, mobile VR headsets now have the ability to replicate precise head tracking and physical space awareness. An exciting announcement came from Occipital who launched a 6-DoF tracking technology for AR/VR devices using only one camera and IMU. Incredibly, Occipital is able to render a simplistic representation of the physical environment. The simplistic physical representation allows VR users to explore environments more safely. In the AWE “Playground” a particular crowd favorite was the VR experience from GlobaCore which demoed a free roam virtual reality experience, utilizing MSI backpack VR and motion capture technology to create an immersive untethered experience. Each player was fitted with a MSI backpack, Oculus Rift HMD and Oculus touch hand controllers. A tour guide walked us through several virtual scenes (worlds), to prevent collisions and help with directions every player was represented as a face and hand outline. The Augmented reality exhibits mostly fell into three groups; mobile devices, head mounted visors and glasses. The current selection of AR glasses mostly consists of a heads up display screen, similar in many ways to Google Glass. It’s believed later this year light field technology will advance and take over the glasses category. Many of the head mounted visors offer a robust augmented reality experience with excellent tracking, the most popular of these devices being the Microsoft Hololens. The Hololens has a limited field of view, which is a popular point of criticism. One alternative to the Hololens is the Meta (Lenovo Partner) a particular crowd favorite, offering nearly complete peripheral field of view augmentation. The Meta is marketed as a designers AR, this marketing strategy is important since the Meta’s incredible power comes from a tethered connection to a computer. Lastly, the mobile AR devices were very popular for screen sharing experiences. Vuforia, one of the largest AR platforms released Project Chalk. Project Chalk is a remote presence capability that helps people to help each other. Using proprietary tracking technology, Project Chalk provides users the ability to freeze the screen to make annotations and have them be displayed on the other end in the correct location. This tool will be great for remote technicians in need of assistance from someone back at the office (i.e. “push this button that I’ve circled”).